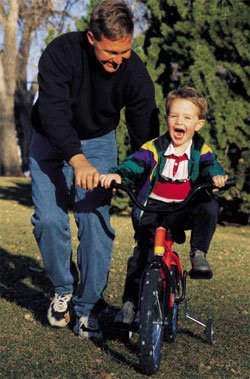 ....I remember my dad teaching me to ride a bike, alternately yelling "pedal!" then "steer!" and trying not to appear too dismayed by my epic uncoordination. Now it's time to teach my son to ride a bike and he -- like Calvin -- thinks his bike is out to kill him. What are your learning-to-ride-a-bike memories on this sunny Father's Day, as either the teacher or the student (or the tiger)?